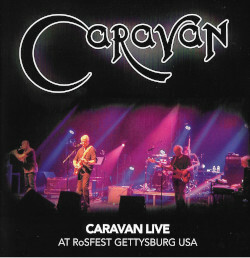 Well what a fantastic year for Caravan! It has gone beyond all our expectations. The support throughout our UK tour in October was overwhelming. We greatly enjoyed the festivals in particular High Voltage in June and the Cambridge Rock Festival in August. We went abroad and played to large crowds who knew all the words in Trieste Tel Aviv and Portugal. We will be back next year hopefully with a new Album and many more live dates. 2012 is the 40th anniversary of Waterloo Lily and we will hopefully commemorate this milestone with an album favourite in the new set. Many thanks to Martin Nick Codge Nigel Ralph and Eric for their invaluable support. Have a great Christmas a peaceful New Year and we will see you all soon. Pye Geoff Jan Jim and Mark. This entry was posted in News and tagged 2011 on December 21, 2011 by caravan. And thanks to you guys too not least for the gig of the year in Edinburgh in October – come back soon! And back on the tracks in the Netherlands.